I’m smitten with summer. There’s no time so carefree as this, when the weather itself cries out for us to step back and set aside our obligations—real and imagined—in order to just enjoy the season, the place we’re in, the people around us. I welcome the reminder, and I try to give in whenever possible. To this end, I’ve been making the simplest of meals of late: boiled Romano beans and fingerling potatoes finished with plenty of olive oil and sea salt alongside a hunk of good cheese; big salads; thickly sliced tomatoes with olive oil and balsamic served with fresh bread to fill our bellies and soak up the dressing; avocado toast with Aleppo pepper and lots of herbs. These dishes, I find, go wonderfully with such things as porches and glasses of wine and lingering evenings, when even the sun stays out late to enjoy the glory of the season. I am one who is often stressed and slow to relax. I have very long to-do lists and require a solid thirty-six hours of vacation to truly calm down. I’m working on these tendencies. Summertime helps. But so does my cooking philosophy. I cook very simply most days, starting with the produce that catches my eye at the market or has just sprung into season and turning it into a meal with the help of a few usual suspects: great olive oil, lemon juice, fresh herbs, black pepper, flaky salt. I turn to nuts, seeds, interesting cheeses, good toasted bread, beans, legumes and eggs to bulk things up, and much of the time, that’s it! I’m giving away my secrets here, but frankly, I’m happy to share. Believing that meals can be so simple as this is freeing. It has the power to make cooking so much less intimidating, which it truly ought to be. As some of you might know, I write a little column on this very subject for Edible San Francisco (a wonderful publication that’s fearlessly pulled together by editor Bruce Cole and consistently full of solid content—I’m honored to be part of it!). Called “Simple Recipes for the Season,” my piece is tucked into the back spread of the magazine, charmingly illustrated by the very talented Heather Hardison. Every season, I share a handful of recipes centered around the freshest goods of the moment. And they really are simple—no ingredient lists or measurements, just a few instructions and a pretty illustration. Since this is how I love to cook, the assignment is bliss. As I wrote my summer recipes (keep your eyes peeled for that issue, coming soon! ), I realized that I should share more of these little gems on my site. You can find a smattering of my past recipes here, and what follows comes from spring’s issue. I’m planning to offer more simple recipes throughout the summer, as I’ve always got more of these up my sleeve. While not the most innovative or shocking of recipes, they are (along with baked goods, of course) the ones that make me happiest. I hope you’ll find yourself feeling the same. I have been making this salad for over a year now, and I am still just as smitten with the combination as the day I stumbled upon it. If you have a reduced balsamic vinegar (or want to reduce it yourself! ), that would be, perhaps, even better. If you don’t have mozzarella on hand, use Feta or goat cheese. If you can’t find sunflower sprouts, swap in another type of sprout, or try a soft green herb like mint, parsley, chervil or basil. Arugula would be lovely as well. Be sure to serve this with good bread so you can finish off the remnants of the dressing once you’ve gobbled up the salad. Tear mozzarella into bite-sized pieces. Arrange the pieces on a plate along with hulled, sliced strawberries. Generously drizzle the salad with balsamic vinegar and olive oil. 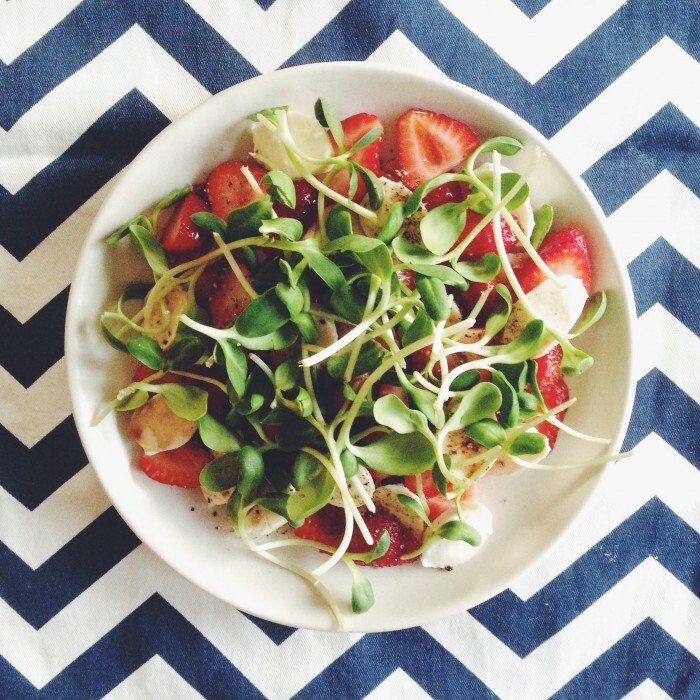 Finish with flaky sea salt, cracked pepper and a big handful of sunflower sprouts. This sounds delicious. I haven’t heard of sunflower sprouts before. Would young spinach or dandelion greens work as well? Absolutely! Any soft, flavorful bunch of greens or sprouts or herbs would work wonderfully here. Let me know if you try it!